237 BC - 476 AD Part of Roman Empire. 476 - 493 Part of the kingdom of Odovacar (see Italy). 493 - 553 Ostrogothic rule (see Italy). 553 - 568 Part of Eastern Roman (Byzantine) Empire. 568 - c.760 Lombard (Langobard) rule (see Italy). c.760 - Aug 843 Part of Frankish kingdom. Aug 843 - 879 Part of Lotharingia. 879 - 933 Part of Burgundy (with county of Provence). 933 - 6 Sep 1032 Part of the Burgundian Kingdom (Arelat). Emperor of Germany (Holy Roman Empire). (claimant to County of Provence). 10 Jun 1215 First stone of the fortress is laid. 22 Jul 1262 Genoese possession confirmed by count of Provence. (occupied by Guelphs during war). 4 May 1301 - 20 Sep 1331 Genoese rule (by convention of 10 Apr 1301). 19 Nov 1346 Grimaldi acquire Mentone (Menton). 2 Jan 1355 Grimaldi acquire Roccabruna (Roquebrune). 15 Aug 1357 - 11 May 1397 Genoese rule. branch of the Grimaldi dynasty. 5 Nov 1402 - May? 1419 Genoese rule. 6 Oct 1428 - 18 Mar 1436 Duchy of Milan rule. French suzerainty 6 Mar 1509 - 20 Feb 1512). 10 Dec 1506 - 22 Mar 1507 Under siege by Genoa. ratified by Monaco 10 Apr 1525). 11 Nov 1605 - 17 Nov 1641 Spanish forces station in Monaco. protectorate of France by Treaty of Péronne. 23 Dec 1678 First constitution promulgated. 31 Dec 1688 Monaco recognized as prince étranger by France. 24 Feb 1793 - 1 Mar 1793 Occupied by France. département Alpes-Maritimes (see Italian states). 15 Oct 1793 Monaco renamed Fort d'Hercule (Fort-Hercule). 12 May 1800 - 31 May 1800 Austro-Sardinian occupation. 17 Apr 1814 Provisional government established (by revolt). 17 May 1814 - 17 Jun 1814 Austrian occupation. ratified 31 May 1814; effective on 17 Jun 1814). 13 Mar 1815 - 20 Nov 1815 Anglo-Sardinian occupation. 20 Nov 1815 French protectorate transferred to Sardinia-Piedmont. 8 Nov 1817 - 18 Jul 1860 Protectorate of Sardinia-Piedmont. 10 Nov 1849 Menton and Roquebrune annexed by Sardinia-Piedmont. 18 Jul 1860 - 24 Oct 2002 Protectorate of France (confirmed 17 Jul 1918). 16 Nov 1942 - 9 Sep 1943 Occupied by Italy. 9 Sep 1943 - 3 Sep 1944 Occupied by Germany. (c) from 30 May 1814: Par la grâce de Dieu, Prince Souverain de Monaco ("by the grace of God, Sovereign Prince of Monaco"). The dynastic name has been preserved through several changes in patrilineage: all males marrying female heirs to the principality (as i.e. the father of Rainier III) have changed their family name to Grimaldi. All princes since Jacques I carried the additional title of duc de Valentinois (from 18 Jul 1642), together with a very long list of other (actually extinct) titles: duc de Estouteville (from 23 Apr 1751), duc de Mazarin et de Mayenne (from 13 Dec 1826), prince de Château-Porcien (from 13 Dec 1826), marquis des Baux (from 14 Mar 1643), Chilly et Guiscard (from 13 Dec 1826), comte de Carladès (from 14 Mar 1643), Longjumeau, Thann, Belfort, Rosemont, Ferrette et de Thorigny (from 13 Dec 1826), baron de Calvinet (from 2 May 1642), Buis-les-Baronnies (from 23 Apr 1751), Hambie, Massy, Altkirch, Saint-Lô et de la Luthumière (from 13 Dec 1826), seigneur de Saint Rémy de Provence (from 23 May 1642) et Issenheim (from 13 Dec 1826) et sire di Matignon (from 23 Apr 1751). 2 Jan 1355 Roccabruna (Roquebrune) castle acquired by Monaco. 13 Nov 1428 Submission to Milan for Mentone by hommage. 19 Dec 1448 Mentone and Roccabruna made a fief of Savoia. 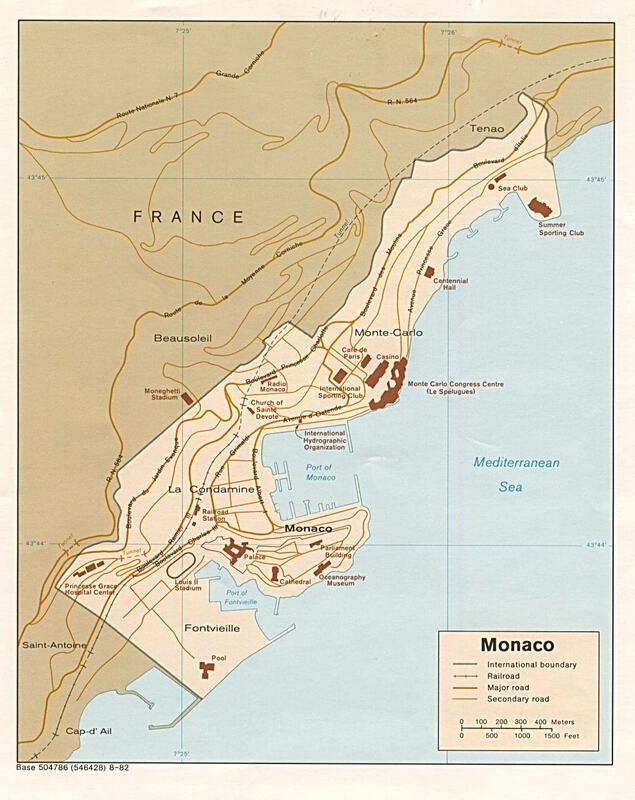 14 Feb 1793 - 30 May 1814 Annexed to France along with Monaco. 17 Jun 1814 Restored to the Principality of Monaco. 22 Feb 1848 Menton asks Sardinia-Piedmont for protection. 2 Mar 1848 Provisional government established in Menton. is deposed and then banned on 28 May 1848. 3 Apr 1848 Menton occupied by Piedmont-Sardinia. governed according to Sardinian law. the intendant general of Nice. 10 Nov 1849 Annexed by Sardinia-Piedmont. France by Sardinia-Piedmont (effective 14 Jun 1860).